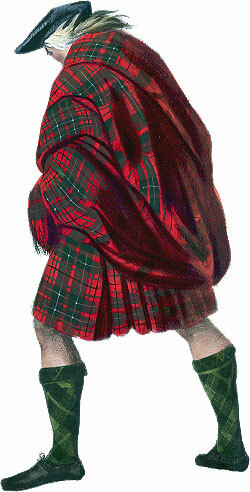 Highlander wearing the Philamhor belted plaid. Only in the last few years has written evidence come to light to prove what historians suspected had to be the case, and that is that loops were sewn into the philamhor through which the belt (or if they were on the inside, a cord) would be threaded and the philamhor hung on a peg for the night. Donning the garment was then no problem and the lack of precisely folded pleats would not have bothered the Highlander one jot. Were he higher up the social scale then evidence suggests that his pleats would have been permanently sewn into the plaid. Out in his natural environment of hill and moor, the Highlander’s philamhor was the Johnnie a’thing of outdoor clothing. Just by folding and tucking he could engineer pockets galore that would hold game birds or rabbits, tools or weapons and any other essential items. In hot weather the top could hang down off the shoulders and be tucked into the belt; in inclement weather the spare fabric formed the forerunner of today’s ‘hoodie’ and sheltered the wearer from wind, rain and snow. The Highlanders were the hardiest of individuals and sleeping outdoors in all weathers and seasons was frequently the norm. Cocooned in his trusty philamhor, the Highlander could be as cosy as if wrapped up in a modern 15 tog duvet. Unlike a duvet user, if there was an icy wind blowing or snow in the air or on the ground, the Highlander would immerse his philamhor in a stream or lochan, whereupon the wool fibres would swell and form a near impenetrable barrier to the elements. It’s also reported that in sub zero conditions he would do the same which would result in the formation of a protective skin of ice on the outside of the philamhor whilst he, with his warm, moist breath, would remain snug inside. "I observed that these parties had always some foot with them, and yet if the horses galloped or pushed on ever so forward, the foot were as forward as they, which was, an extraordinary advantage. These were those they call Highlanders; they would run on foot with all their arms and all their accoutrements, and kept very good order too, and kept pace with the horses, let them go at what rate they would." Garth then went on to say: “This almost incredible swiftness with which these people moved, in consequence of their light dress, and unshackled limbs, formed the military advantage of the garb, but, in the opinion of the Lord President Forbes, it possessed others, which he stated in a letter, objecting to its abolition (in 1747), and addressed to the Laird of Brodie, at that time Lord Lyon for Scotland. ‘And it is to be considered, that, as the Highlanders are circumstanced at present, it is, at least it seems to me to be, an utter impossibility, without the advantage of this dress, for the inhabitants to tend their cattle, and go through the other parts of their business, without which they could not subsist, not to speak of paying rents to their landlords.’"